I like very much this Article keep it up!!!! my sugestion for the Opera if you ask me can be Aida or Madam Butterfly!!!! Barber of Seville - hilarious. Or Don Giovanni - which is the first opera I ever saw and was so mesmerised by the performance that on coming away afterwards I drove down a one way street the wrong way only to enocounter a police car driving towards me! For me Madame Butterfly would not be a good idea as it has too much recit - so difficult to understand what's going on. I think L'elisir d'amore is a good idea. Alagna as Nemorino too. I think that something down the lines of Traviatta, Rigoletto, or La Boheme would go down well. They aren't long, the plot is simple, and the music is easy on the ear. I agree with Laurie O'Brien: Everything with Christopher Maltman would be perfect - perhaps his Papageno in April is a good suggestion for beginners. Otherwise I think L'elisir d'amore, La Traviata, Rigoletto, La Boheme, Tosca or Barber of Seville are a good idea. In my opinion Figaro and Cosi are extremely boring (too much recit), but in the end it depends: you can never know what's the right opera to fix a special person. One of my friends fell in love with opera after a Salome. La Bohéme y mucho más todavía si es cantada por Rolando Villazón, Es una ópera que llega a lo más profundo y también divierte. Gracias. Der Freischuets! It's beautifully and harmoniously! I suggest "The Magic Flute" K620 is the best opera for the beginner. I really think that Rossini and Mozart are very good choices for Opera beginners. Even more than the obvious Verdi titles. I'll always remember my first Barber and also my first Magic Flute. I will never forget the first time I went to La Scala performing La Gioconda di Ponchielli. Great the combinations of Opera and dance, with music familiar and easy to listen to, dinamic and emotional. Another one could be Il Viaggio a Reims di Rossini, ideal to introduce Opera to a beginner, allegra and exiting. I once introduced a group of my young piano students to opera with a video of La Boheme by the Australian Opera. They were enthralled and talked about it for years afterwards. For newcomers I would also recommend L'Elisir d'Amore. 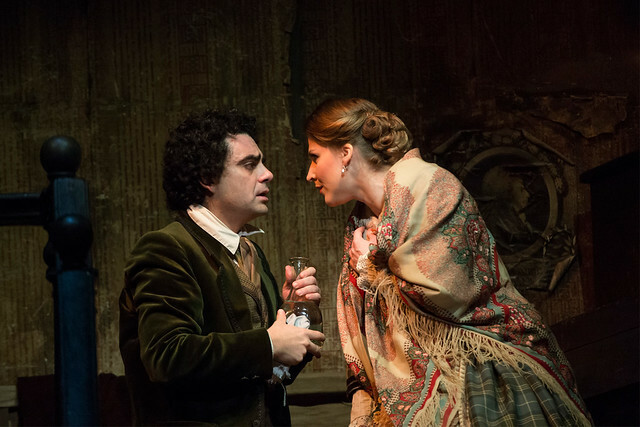 Rolando Villazon is my tenor of choice in the role of Nemorino - delightfully portrayed with just the right mix of sensitivity and humour. BBC i.e. Carmen, Boheme and Butterfly. If you are not moved by any if these popular operas (and they are popular for a reason) then you have a heart of flint. Go see, you won't regret it!